NEW YORK - Nancy Strumwasser, a New Jersey high school teacher, always thought she would have two children. But the layoffs that swept over the U.S. economy around the time her son was born six years ago helped change her mind. Though she and her husband, a market researcher, managed to keep their jobs, she fears they won’t be so fortunate next time. “After we had a kid in 2009, I thought, ‘This is not happening again,’ ” said Strumwasser, age 41. The financial crisis that followed the collapse of U.S. investment bank Lehman Brothers in 2008 did more than wipe out billions in wealth and millions of jobs. It also sent birth rates tumbling around the world as couples found themselves too short of money or too fearful about their finances to have children. Six years later, birth rates haven’t bounced back. For those who fear an overcrowded planet, this is good news. For the economy, it is not so good. We tend to think economic growth comes from working harder and smarter. But economists attribute up to a third of growth to more people joining the workforce each year than leaving it, thereby increasing production, earning and spending. Now this secret economic fuel — rarely missing and little noticed — is running out. 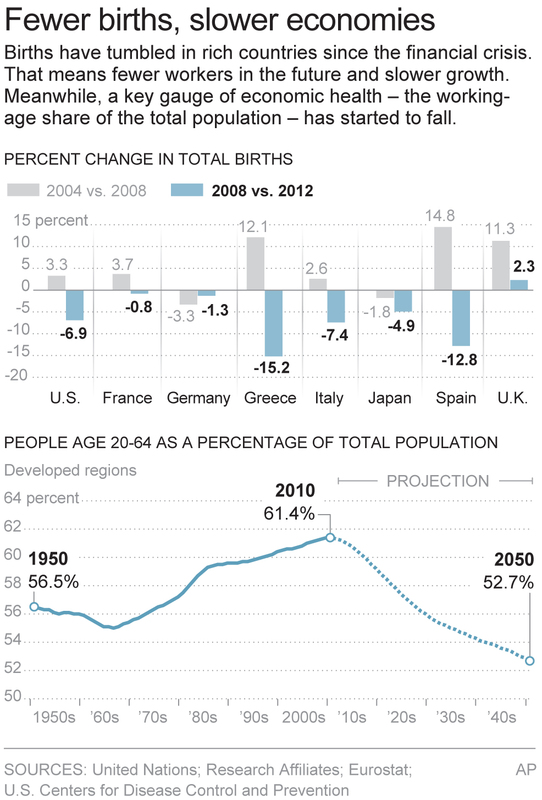 Births are falling in Japan, China, the U.S., Germany, Italy and nearly all other European countries. Studies have shown that births drop when unemployment rises. Birth rates have fallen the most in some regions that were hardest hit by the financial crisis.In the United States, three-quarters of people surveyed by Gallup last year said the main reason couples weren’t having more children was a lack of money or fear of the economy. The trend emerges as the growth in the pool of potential workers, ages 20 to 64 — a key gauge of future economic health — is faltering, signaling trouble ahead. This labor pool had expanded for decades, thanks to the vast generation of baby boomers. Now the boomers are retiring, and there are barely enough new workers to replace them, let alone add to their numbers. Growth in the working-age population has halted in developed countries overall. Even in France and Britain, with relatively healthy birth rates, growth in the labor pool has slowed dramatically. In Japan, Germany and Italy, the labor pool is shrinking. The drop in birth rates is rooted in the 1960s, when many women entered the workforce for the first time and couples decided to have smaller families. 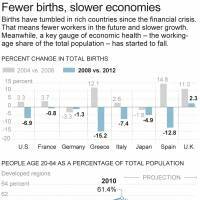 Births did begin rising in many countries in the new millennium, but then the financial crisis struck. Stocks and home values plummeted, blowing a hole in household finances, and tens of millions of people lost jobs. Many couples delayed having children or decided to have none at all. 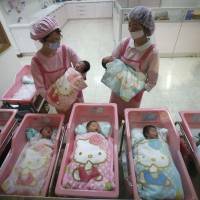 Couples in the world’s five biggest developed economies — the United States, Japan, Germany, France and Britain — had 350,000 fewer babies in 2012 than in 2008, a drop of nearly 5 percent. The United Nations forecasts that women in those countries will have an average of 1.7 children in their lifetimes. Demographers say the fertility rate needs to reach 2.1 just to keep populations constant. A return to “normal” growth is unlikely. Economic growth of 3 percent a year in developed countries, the average over four decades, had been considered a natural rate of expansion, sure to return once damage from the global downturn faded. But many economists argue that pace can’t be sustained without a surge of new workers. Reduced pay and lifestyles. Slower economic growth will limit wage gains and make it difficult for middle-class families to raise their living standards and for those in poverty to escape it. One measure of living standards is already signaling trouble. Gross domestic product per capita fell 1 percent in the five biggest developed countries from the start of 2008 through 2012, according to the World Bank. A drag on household wealth. Slower economic growth means companies will generate lower profits, thereby weighing down stock prices. And the share of people in the population at the age when they tend to invest in stocks and homes is set to fall, too. All else equal, that implies stagnant or lower values. Births might pick up again, of course. But even a return in births to pre-recession levels will leave families much smaller than they were decades ago, a shift that has already affected industries and economies around the world. In Japan, sales of adult diapers will exceed sales of baby diapers this year, according to Euromonitor International, a marketing research firm. In South Korea, where births have fallen 11 percent in a decade, 121 primary schools had no new students last year. And in China, where the working-age population is set to shrink next year, the government is relaxing a policy that had limited many families to one child. It might not help much. Chinese are choosing to stick to one on their own. Economists are worried not just because growth is stalling in working-age populations. Workers’ numbers as a share of the total population in many countries is falling. Economists like to see this share of total population rise, because it means more people are earning money, expanding the tax base and paying for schools for the young and pensions and health care for the old. Before the recession, the number of these potential workers as a proportion of total population was falling in three of the world’s six biggest developed economies: Japan, Germany and Italy. Now the proportion is also dropping in the United States, France and Britain, according to investment firm Research Affiliates. Economists say it is rare for the number of working-age people as a share of the total population to fall in so many major countries at the same time, and it is usually because of war and famine. The six countries with declining proportions of working-age people now, plus China, accounted for 60 percent of global economic output in 2012. 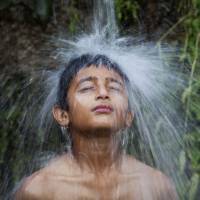 The drops are small — a few tenths of a percentage point each year in the proportion of working-age people, which peaked in developed countries at 61.4 percent in 2009. But Research Affiliates expects the working-age proportion of the population to fall steadily for decades, slowing economies each year, until it bottoms out at about 50 percent in roughly 2040. A country can compensate for this demographic drag on growth by encouraging people to work longer or to use technologies to increase output. But most economists doubt that such changes are forthcoming or would be enough. Robert Arnott, chairman of Research Affiliates, thinks investors and policymakers don’t realize how much demographics will hurt economies now because they never appreciated how much they helped in the past. Payrolls rose as the oldest baby boomers started working in the mid-1960s — then kept rising as those born later took jobs. Retirees were relatively few because most workers were young. And many women joined the workforce for the first time. It was an unusual confluence of beneficial demographic shifts that may be impossible to repeat. From 1960 to 2000, GDP per capita rose an average of 2.6 percent a year in the big six developed countries. Since then, it has grown less than 1 percent annually. Arnott thinks the demographic drag is going to worsen, subtracting roughly a percentage point from the annual rate in the next few decades. That suggests living standards that are barely growing, or even falling. Andrew Cates, senior international economist for UBS in Singapore, worries that people accustomed to living better each year won’t accept the new slow-growth future and will demand change through protests. “It’s a recipe for social instability,” he said. Even optimists see the world at a delicate crossroads. Reiner Klingholz, head of the Berlin Institute for Population and Development, says societies are unsure of their goals now that easy economic expansion is over. “We have no plans for how to run a society without growth,” he said. First, retirees don’t produce anything. So a country’s output falls unless new workers producing the same value of goods and services replace them. Second, retirees don’t save, invest and spend as much as workers with paychecks. That cuts demand and slows growth. A third reason is less obvious. Productivity of workers, or output per hour, tends to peak as they reach their mid-50s. The increases in productivity as they near that age tend to be small. And with economic growth, only the change in productivity from year to year counts, not the level. In other words, you may be very productive at work, but unless you are becoming even more so each year or work more hours, you are not helping the economy grow. And older workers past their peak productivity, by definition, subtract from growth. 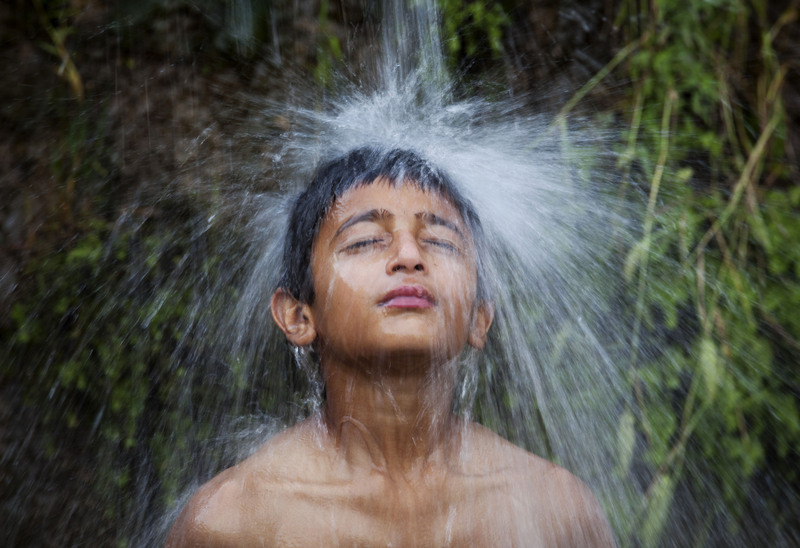 Some factors potentially could offset lower birth rates and help fuel economic growth. Lower unemployment rates would help. Countries can better educate and train their existing workers, attract more immigrants and encourage people to work past retirement age. But many economists think demographic headwinds are just too strong to expect a jump in growth. The best hope is an unexpected innovation leading to a burst of efficiency in the workplace.